Maize (Zea mays L.) breeders are interested in evaluating the seed quality of their inbred lines, as seed quality has a strong relationship to field emergence. There is little information, however, on the influence of the seed quality of the inbred on field emergence of the hybrid. The objectives of this research were to (i) determine whether seed quality tests and a seed quality index of the inbred parents and F2 seed are correlated with field emergence of F1hybrids, and (ii) determine how many tests are necessary to calculate this index. Standard germination (SG), saturated cold (SC), and soak (Soak) tests, and the inbred quality index (IQI) were calculated on inbred parents and their corresponding F2 progeny, and field emergence was measured on associated F1 hybrids produced in Clinton, IL in 2002 and 2003. The tests and index of the parental inbreds and F2 progeny correlated poorly with early field emergence of the F1 hybrids. All tests were required to calculate the seed quality index. By averaging several seed quality tests into a single index, the poor seed quality performance of inbreds and F2 populations in some tests can be masked by other tests. The seed quality index might be useful when ranking inbreds based on seed quality but not as a selection tool. 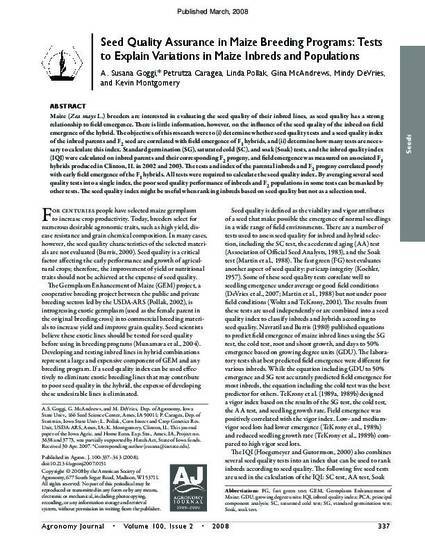 This article is published as Goggi, A. Susana, Petrutza Caragea, Linda Pollak, Gina McAndrews, Mindy DeVries, and Kevin Montgomery. "Seed quality assurance in maize breeding programs: Tests to explain variations in maize inbreds and populations." Agronomy journal 100, no. 2 (2008): 337-343. doi: 10.2134/agronj2007.0151.